A Full Functioned Remote Control Tank With Real Firepower! Tired of using your imagination to fire your R/C tank at the enemy Bawls bottle which maliciously invaded your territorial sovereignty? Imagine no longer, and blast the enemy on your living room carpet with the powerful air motor turret on this R/C tank (uses self generated compressed air). Direct from Japan, this R/C battle tank is ready to bring your childhood battle simulation dreams to life in the comfort of your home or office. Like any childhood battle simulation dream, however, the Battle Tank is not appropriate for children - this toy is for grownups (or 32 year old children). Turret Maneuvers side to side (320 degrees) & up or down (20 degrees). Tank Maneuvers forwards, backwards, spins and has a 'Super Spin' mode. Selectable frequency (A,B,C) on both remote and tank allow up to three tanks to operate at the same time for your own office space wargames (1/24 Scale Green tank only). Load up to 40 pieces of Ammo into the tank at once. Shoot ammo in singles or in quick succession (1 per second). Can fire while on the move! You can purchase additional ammo (150 bb's per bag) using the dropdown to your right! NOTE: THIS IS NOT A TOY. 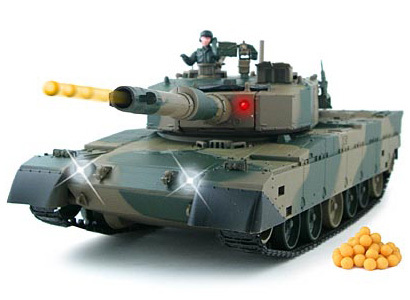 THIS IS AN ADULT REMOTE CONTROLLED TANK WHICH SHOOTS HIGH VELOCITY 6MM PLASTIC AMMO UP TO 25 METERS. SAFETY GLASSES SHOULD BE USED AT ALL TIMES! This site is a demo site only. This product is not available for sale at our site. But you can buy it at ThinkGeek.com , this is where we took description from.